The Afghan governments control of population and districts deteriorated to the lowest levels in recent years. UNAMA reported a significant increase in civilian casualties in 2017 over 2016. The U.S. has experienced in increase in KIA and WIA over 2016 and 2015. There has been an increase in ‘insider attacks’ this quarter when compared to previous quarters. (‘insider attack’ = ‘green on green’, or ‘green on blue’ incidents). The Afghan National Defense and Security Forces (ANDSF) suffered a 9,000 decrease in personnel. (Not a good sign). Armed clashes are at an all-time high according to the United Nations. The U.S. has increased the number of dropped munitions this year against the Taliban and Islamic State; more than any year since 2012. CSTC-A has provided funding for the Afghan Local Police – bringing total ALP funding for salary and incentive costs to $73.8 million per year for the next two years. President Ghani has appointed impressive, reform-minded officials to important government posts but his efforts are stymied by entrenched interests within the government bureaucracy. 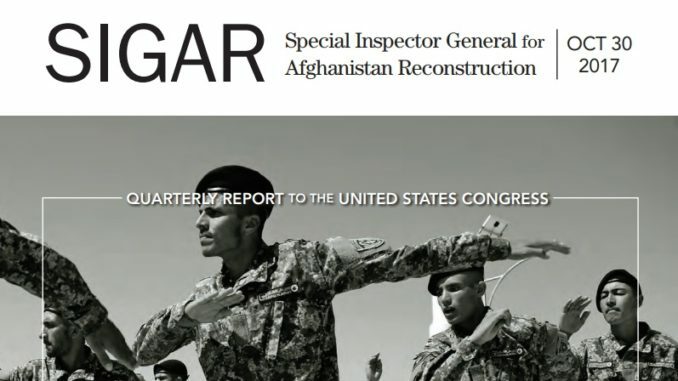 The Resolute Support (RS) headquarters (actually USFOR-A according to the report) has classified much of the data previously available to SIGAR to publish in its quarterly reports available to the public. SIGAR believes there is a lack of ‘transparency’ on the part of RS. SIGAR has implemented a “Lessons Learned Program” that will hopefully be useful for future Security Force Assistance programs in other countries around the world. There is an overview of the new R4&S strategy of the Trump administration. Resolute Support headquarters is moving away from the “Program of Actions and Milestones” (PoAM) as a means of evaluating the progress of the ANDSF. It is assessing the Ministry of Defense and Ministry of Interior on milestones laid out in the new, multi-year ANDSF Road Map.